Dr. Allison was born and raised in Plymouth….Wisconsin! Growing up, she always knew she wanted to help people and was fascinated with physiology and the human body. It was actually her younger sister who sparked the idea of a career in chiropractic. She loved the thought of being able to help people experience better lives with a more natural approach to health. After graduating from the University of Wisconsin – Madison, Dr. Allison attended chiropractic school at Northwestern Health Science University. During this time she had the opportunity to serve on a chiropractic mission trip in Haiti where she fell in love with working with women and children. 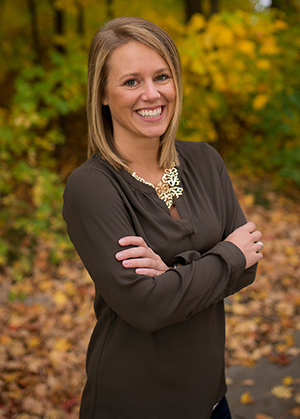 This passion led her to pursue training with the International Chiropractic Pediatric Association, as well as certification in Webster Technique. During her final year of chiropractic school, Dr. Allison began training with Dr. Jeremy, who strongly influenced the way she practiced. She was attracted to his unique approach and high energy, family focused practice and is thrilled to be part of the Experience Wellness Chiropractic Team! Dr. Allison enjoys spending time with her family and two puppies, Tucker and Lucy. She has developed a love for traveling and exploring the world, and has a long bucket list of places she would like to see! Some of her favorite things include summer weekends at her cabin, great books, a good glass of wine and spending time in the sun!